China's official housing index now shows home price appreciation slowing faster than some had anticipated. Other indicators are also pointing to weakness in China's housing markets. 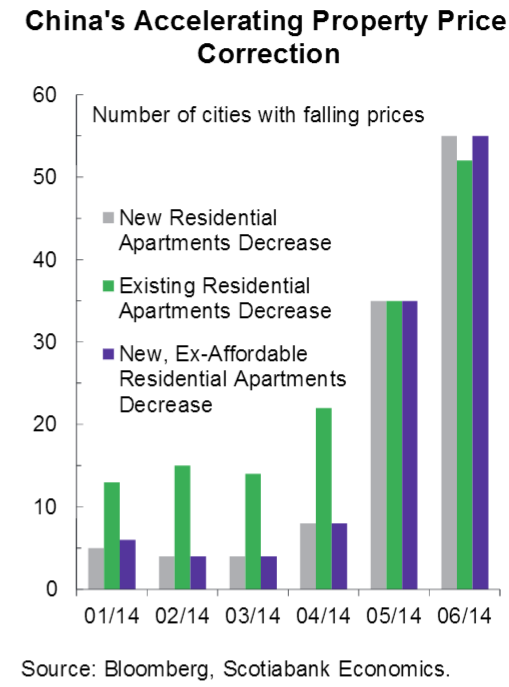 For example the number of cities with falling prices has spiked sharply. Furthermore, the steel rebar futures in Shanghai - an important real-time indicator of construction demand - remain under pressure. Related to the trends in residential housing, China's commercial floor space and the number of commercial buildings sold has declined materially recently (based on official reports). There is no question that Beijing has the wherewithal and the will to support the housing market should things unravel faster than the government likes. Nevertheless, given how pervasive property markets are in the nation's overall economy, concerns among global investors are rising with respect to China's housing slowdown. Scotiabank: - On the theory that where there’s smoke there's fire (and it’s not just because I’m BBQing), weak company financing and concerns surrounding potential defaults in the shadow banking sector coupled with — and likely driven by — further evidence of falling property prices will only amplify the concerns.